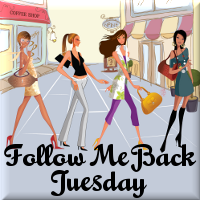 Follow Me Back Tuesday is hosted by: Survey Junkie, Little Yaya’s, Review Retreat and my buddy Boobies, Babies & A Blog! That’s all there is to it . Thanks to all who played our meme yesterday, “Monday’s Music Moves Me” Next week is freebie week, but the whole month of February it’s the month for love. Every week will be love songs for the heart! Thanks to all who took the time to play along with us. Next time bring a friend! Oh hell, bring lotsa friends! Until then be safe, be healthy, but most of all just BE! LONG LIVE ROCK & ROLL! This is a cute meme! But for some reason, I started singing Hollaback Girl though I was singing it as “Ain’t no follow back girl.” So lame! ha ha! Thank you for stopping by, following, and all of your kind words. I am following you back! Your blog looks great, so bright ans happy! Hope you stop by often and become a loyal reader.